Being 'thoughtful' in this way means I also internalize a great deal, which is why I no longer watch movies or read anything horrific or dark. It's too painful. And it means that till lately I've been making only pretty art. I will still make it, because it makes me -- and often others -- smile. But Mark on the Body has begun, and my first full week -- 8 days of stitching, if you count both Fridays, yesterday and the day it began -- and so there are updated photos on that page now. Other Work is all over the place! Yes, the pair was knit from approximately 25 gm of a single 50 gm ball. Buttons were found in my stash but I believe they originated in the bargain buttons at The Crafty Lady, Lacombe. Don't think there are any more, but the shop has several colour variations of that yarn. Lovely stuff! The Magic Tiles quilt top was finished, with only a pieced border; it's about 45" square. 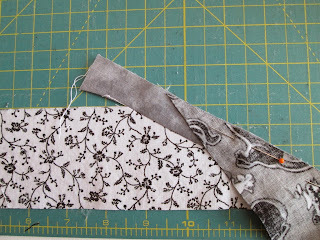 Because the border piecing picked up on the wonky construction of the blocks, I used 2 1/2" strips, cut at weird angles, and joined together with 1" "grout" strips. 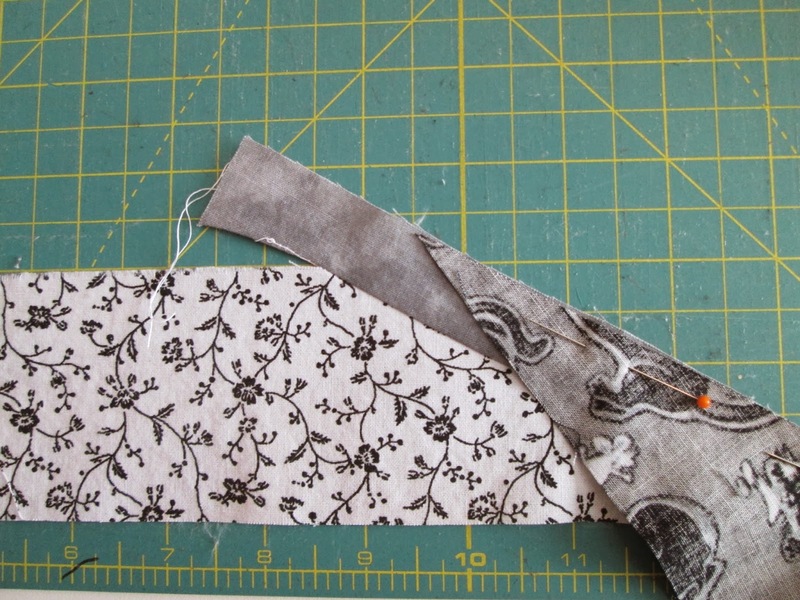 I had to remember to move one strip up just slightly -- by 1/4" -- in order for them to line up evenly when actually sewn together. See the tip of the right-hand piece of fabric, lying just a hint above the corresponding edge of the left-hand (B&W print) one? Alas, however, the quilting of this piece is on hold for now. It was to be a baby gift for the first grandchild of cousins of mine Back East...but I found out earlier this week that the wee babe was miscarried at 25 weeks. The baby was due this month, so Christmas will be a sombre and tender time for the family this year. I'm told the young couple will try again, so I will bide my time on this one and wait for good news. In happier news, I also found out this week that two of the four pieces I'd completed for the first year of the 15 x 15 Group's challenges have been selected to go to Quilt Expo in Beaujolais, France, running April 10 - 13, 2014!! The selections are "Tree Study I" and "To Everything There is a Season". I'm thrilled!! You can see these pieces -- and all the pieces submitted by the group -- on our blog HERE. 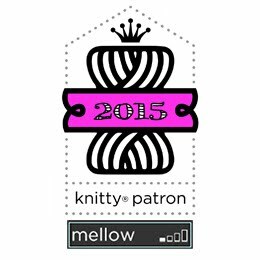 Click on the Quilt Gallery tab, and you will get a drop-down list of the themes for the year. My pieces are found in "Texture" and "Time". Also in good news, a few days ago I received an e-mail from a SAQA member and delighted viewer of SAQA Western Canada's touring Exhibit, The Burgess Shale Project, which is hanging in the library at Turner Valley School till December 11. Her nephews go to the school, so she and her parents drove out at -20 C to visit them and the exhibit. The librarian was effusive about the exhibit's impact on all who'd seen it, and so was our viewer. She gave me permission to post her e-mail on the SAQA WC blog -- and I sent a copy to Desi Vaughan, the SAQA Regional Rep Coordinator. I'm tickled! As for what's going on in the studio...3-4 more knitted gifts, 2 more miniatures, and 1 more piece for the next 15 x 15 challenge on the theme of "Rhythm". So...even though it's Saturday, I'm linking up with Nina Marie's Off-the-Wall Friday...and wish you all a fine weekend! Well, congratulations! Have a warm and wonderful weekend! Hope your staying warm. 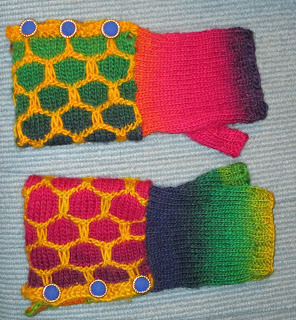 I love those fingerless gloves you made. Makes me think I should find a way on to your gift giving list. Kidding of course. I hope the new owners will love them. Congratulations on your exhibit and all the good news! 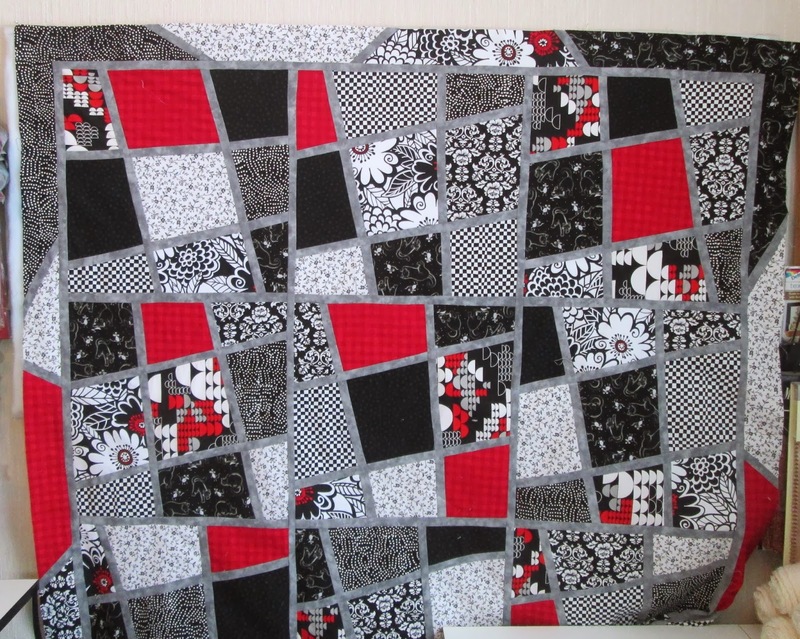 Love the black white and red piece...vibrant! 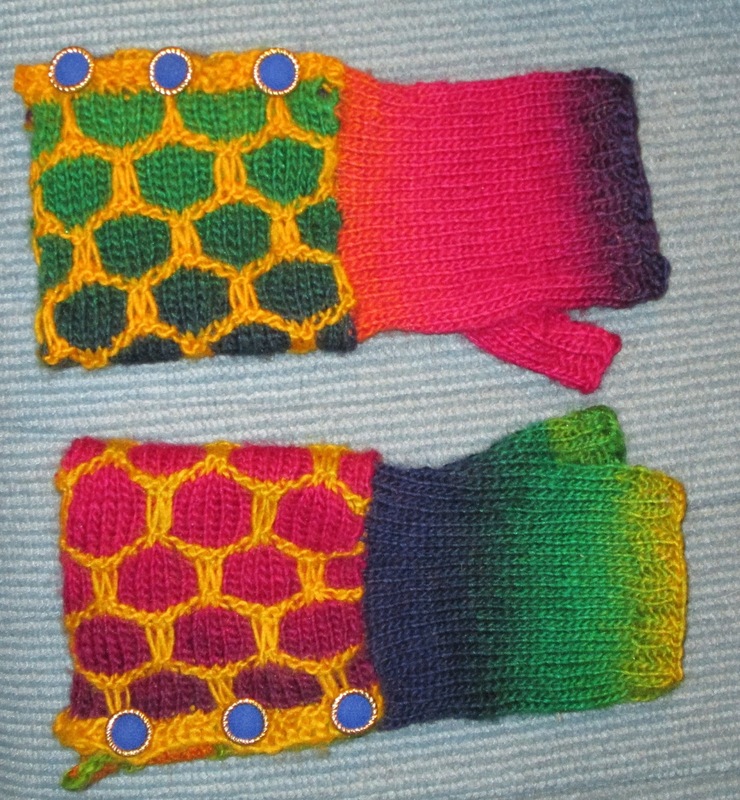 The mittens are fabulous, I am sure the recipient will be thrilled and warm! Know what you mean about being sensitive to dark books and film... I am getting that way as well.